The combined business conducted by Complete Claim Management (CCI) and Script Connection offers physicians and medical clinics an ancillary program to treat their patients with topical prescription medicine to manage pain. The program is designed for patients with work related injuries managed under worker compensation claims. The program both delivers the topical medicine to the care provider for sale to the patient, as well as providing the care provider with insurance claim processing services on behalf of the patient. Neither CCI nor Script Connection is a compounding pharmacy and neither entity is involved in creating topicals with compounding pharmacies. 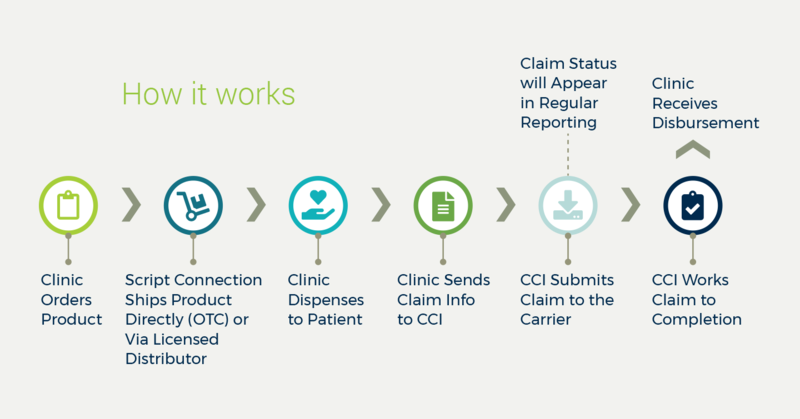 Additionally, Script Connection offers a full formulary program that will also utilize the claim management services of CCI. CCI offers and provides administrative and billing services to physician practices desiring to make certain over-the-counter (OTC) products, including non-narcotic topical medications, patches, and creams and certain oral prescription medications available to patients in the physician practice’s office. These products are offered through Script Connection. CCI also provides billing and collection services in cordination with Script Connections’s sales and distribution of OTC Products to Practices participating in the OTC Program. For each state CCI conducts business in, there has been a comprehensive legal analysis performed by a division of a top 100 US law firm that specializes in healthcare. The firm has determined the program to be legal and acceptable within the statutes of each state examined. With CCI managing your WC collection efforts, you can spend more time treating your patients. Your office staff can focus on managing appointments and patient care, while CCI performs your billing and collection activity. Script Connection offers you a selection of quality OTC and Rx topical pain relief medicines, plus the option of oral medication dispensing through its Full Formulary Program. CCI’s billing and collection analyst‘s customer service representatives have achieved tremendous success improving the revenue cycle of Workers’ Comp claim processing. CCI’s active clients receive consistent collection payment each month. For even greater processing speed and collection percentage, ask about CCI’s NCPDP program. CCI monitors regulations for any changes that may affect the WC claim process. Additionally, CCI will alert its clients to changing trends in claim processing by insurance carriers. CCI and Script Connection has a team of Sales Representatives that stand ready to walk you through the process. They can assist in getting you samples, reports or any other information that can assist you with the program. Faster turn around from script to check. 4-6 weeks with NCPDP vs 8-10 weeks with paper bills.